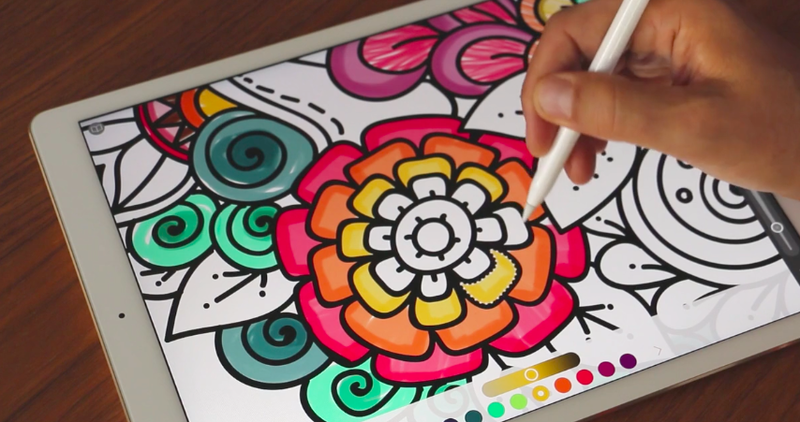 Adult colouring books have become exceedingly popular this year so it’s not surprising to see them get transformed into apps — what’s surprising is how good Pixite’s app version, Pigment, really is. The idea behind adult colouring books is that they help you stay focused, reduce anxiety and bring a new sort of mindfulness to your life. Adult coloring books really took off when Laurence King publishing house asked Johanna Basford, an illustrator known for her monochrome designs on wine and perfume bottles, to create a sophisticated coloring book for adults. It really is a phenomenon of sorts, especially since adult coloring books aren’t even a new thing. It seems this time round, the backing of social media had a huge part to play in the trend’s success. There isn’t much choice in terms of digital coloring books for adults on the app store, surprisingly. So, after all the hype, I was excited to give Pigment a proper go and see how it lived up to its paper-made competitors. And it didn’t disappoint. The first thing that struck me was the beauty of the interface. It’s as nice as the actual designs and still simple and clean, without looking too basic. All of the tools you need are neatly organized into tabs. You can adjust the colors, size and style using sliders and the coloring process is done using your finger or an Apple Pencil, if you’ve got one. The app is divided into two main sections – My Work and Library. When you first open it, there will be drawings in the My Work section that act as demos. They are already partially colored in and are a good way to get started and play around with the various tools. You can start a new piece by choosing a new one from the Library, which has about 20 different books filled with drawings (and being updated daily), so there’s no shortage of choice. There’s everything from Animals to Abstract Patterns and Geometric Designs. When you spot one you like, just tap on it and it’ll become available in the My Work section for you to get coloring. When you’re coloring, you can choose between a pencil, marker, paint bucket, airbrush, pen or regular brush. With support for the Apple Pencil (or any third-party stylus) and 3D Touch, coloring feels as realistic as it can be on a phone screen. It’s not as dissatisfying as I thought it might be, given that it’s a screen and not paper. Pigment has made it easy to choose colors that go well together by grouping them into themes, rather than making you decide on your own. You can stick to one theme or mix them up to your own liking. Any color you do choose can be adjusted with a slider as well. Coloring inside the lines is what we’re all programmed to try and do, so Pigment gives you a hand by letting you cheat and stay within the lines by selecting them. Because some of the drawings are intricate and elaborate, it could take a little time to finish properly, so you can save them when you’ve spent enough time on them for coming back to later. You can also share your designs on social media or save them to your phone to show off. The app is free so there is a watermark on the drawings, but you can rid yourself of that by signing up to the premium version. The premium subscription also gets you access to more drawings in the Library every day and you can save your works of art in high resolution, which is perfect to print. I’ve been playing around with Pigment for a little while now and found it particularly fun to use in the airport while traveling and I can see how it would act as a stress reliever. It’s a beautifully simple app and suitable for anyone who has already gotten into the adult coloring book trend or not.